30. The Chabad Jewish day school (School #170) enrolls a total of 352 youngsters, a significant decrease from its maximum of 502 in 2003. The largest single number – pupils in grades five through 11 – convene in the upper two floors of a general public school building. A renovated kindergarten building accommodates the Chabad preschool and lower school. Also included in the pupil census are a small machon for girls in grades five through 11, which meets in classrooms in the choral synagogue, and a yeshiva katana for boys in grades five through 11, which meets in a partially renovated smaller synagogue. Grigory Shoichet, School 170’s veteran and highly respected principal, was quick to emphasize the academic achievements of School #170, a seriously underfunded institution in a city known for its strong school system. Of the 260 schools in the city, he said, #170 ranks 32nd. It is especially strong in mathematics, physics, and biology; School #170 has done very well in academic competitions in all of these subjects, he observed. The great weakness of the school, he continued, is in computer science; JDC managed to divert an ORT computer laboratory intended for the school to its own Jewish community center (where it was used for a fee-based adult education program) some years previously and School #170 has been unable to muster resources to replicate the ORT school program on its own. The school currently has five computers. It is very difficult to raise money among school families for computers or any other school needs, stated Mr. Shoichet, because the school population is overwhelmingly poor. He estimated the unemployment rate among parents at 30 to 40 percent, observing that many local factories had closed. Even well-educated engineers previously employed in some of these plants have been unable to find jobs. Mr. Shoichet said that the school provides both breakfast and dinner to its pupils, and some youngsters remain in the school until 6:00 p.m. rather than go home to empty apartments while their parents scramble for whatever work they can find. The curriculum of School #170 includes three to four class periods in Jewish subjects each week, Mr. Shoichet stated. Tough government standards mandate inclusion of art, music, and other subjects in the school curriculum, he said, and limit the number of classes in religion that can be taught in public schools. The school supplements formal instruction in Jewish subjects with the development of small museums on Jewish history in Ukraine, the Holocaust, the role of Jewish women in Jewish history, and several other topics. 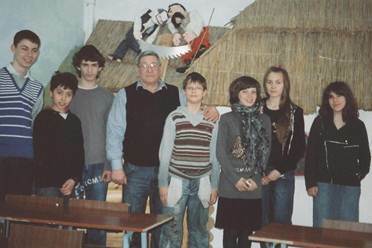 Grigory Shoichet, fourth from left, stands with some of his pupils in front of a school museum display. Declining enrollment has freed classroom space for conversion into small museums. School #170 has a small physical training room and rents a larger sports hall in a nearby medical school. Mr. Shoichet, a former Ukrainian national boxing champion, is in his mid-70s. He provides intensive physical training to interested pupils individually. Mr. Shoichet said that School #170 relies on funds raised by Kharkiv Chief Rabbi Moshe Moskovitz. It receives nothing from Lev Leviev, the Chabad philanthropist who supports many newer Jewish day schools in the post-Soviet states. Mr. Shoichet observed that the Jewish Agency for Israel is suffering from its own budget crisis and is unable to provide funds for additional day school programs as it used to do. The government of Israel, he added, should offer more help to Jewish day schools, if only to better prepare pupils for aliyah and productive lives in the Jewish state. However, he said, he is fortunate to be working in Kharkiv with Chief Rabbi Moshe Moskovitz, who is a настоящий раббин, a “real” or “genuine” rabbi, someone who “touches peoples’ hearts”. 31. The yeshiva katana directed by Rabbi Levi Raices enrolls 40 boys in fifth through 11th grades. (These boys are counted as part of the School #170 census.) The yeshiva katana operates as a mesivta, that is, it offers a full program of general academic studies as well as a full religious studies program. The majority of boys are from poor families, said Rabbi Raices, and receive a small stipend that is intended both to supplement family income and to “compensate” boys for the single-gender circumstances of their school experience. Most youngsters live at home, said Rabbi Raices, but a minority live in dormitory rooms that have been constructed within the old synagogue in which the mesivta classes are held. Rabbi Levi Raices, left, manages the Kharkiv Chabad yeshiva high school and has other teaching responsibilities in the Kharkiv Chabad community. 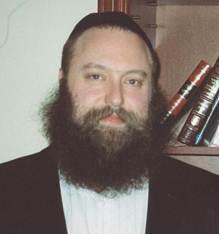 Upon completing the mesivta, said Rabbi Raices, about half of the boys will enroll in the Chabad yeshiva in Moscow. The other half, he continued, will attend local universities or colleges, or enter the work force. One graduate, Rabbi Raices noted, is a prison guard. In addition to the yeshiva katana, Chabad operates a heder in the old synagogue that educates 15 to 20 boys who are sons of Chabad rabbis in the city. The heder provides an intensive religious education to boys until they reach bar mitzvah age. Not limiting his teaching to youngsters, Rabbi Raices also teaches a twice-weekly class to 40 retired men in the synagogue dining hall. Lunch is served. Chabad is eager to bring these men into the synagogue, said Rabbi Raices, so that they feel that they are part of the community. Apart from his teaching responsibilities, Rabbi Raices is publishing a set of books entitled Навстречу Мошиаху (To Meet the Messiah), a Russian-language translation (from Hebrew) of a collection of stories, articles, and brief excerpts from midrash, Talmud, and history interspersed with sayings of Rabbi Menachem Mendel Schneerson, the seventh and last rebbe of the Chabad Lubavich movement. So far, said Rabbi Raices, he has published four volumes in the series. He believes that because all of the entries are fairly brief, these books may appeal to many readers who are uncomfortable with longer, more complex explications of Chabad philosophy. The secular studies program is strong, said Ms. Yakimenko. Machon girls earn high scores in various academic competitions. Ms. Yakimenko stated that she would like to increase enrollment in the school to 60 or 70 girls, noting that classes with fewer than five or six girls can be just as difficult to teach as classes with 40 pupils. 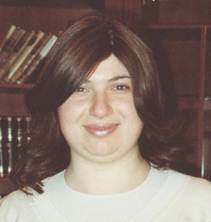 In response to a question, Ms. Yakimenko said that most girls who complete the machon enter the Akademia program or enroll in Chabad women’s colleges in Moscow, Zhytomyr, or Israel. Miriam Yakimenko, who is a graduate of School #170, now directs the Chabad machon in Kharkiv. Dinner, which is served in the early afternoon, is the main meal of the day for many Ukrainians and Russians. It usually includes soup, a meat course with side dishes, and dessert. Almost all post-Soviet Jewish day schools with which the writer is familiar provide a hearty mid-day dinner for their pupils.